The biggest story in the last 20 yrs is the Tea Party Revolution. We're witnessing the largest crowds protesting the gummit we have seen since Vietnam. The difference w/these protests are they are not organized and financed by the communist Party and these are people who work and pay the taxes. This was started by a reporter in Chicago just mentioning the Boston Tea Parties and the movement was begun. This movement has stirred the hearts and minds of America and is being witnessed around the World as they silently cheer the courage and passion of true patriots. This is the biggest story in the last 40 yrs. When President George W Bush was President if a half dozen deadbeats showed up for a protest there would instantly be over 100 protesters. Never mind that 90 of them were like minded reporters and cameramen, the numbers of the protesters were always inflated in their size. The reporters would breathlessly report as they used the protesters as props for their already written story. Now to underline their corruption they completely ignore the biggest story of this century due to the politics of a Country in revolt from its citizens. The last thing that the Establishmedia can comprehend is real people would take to the streets protesting their world view. Not only are they a disgrace to journalists throughout histoir like Ben Franklin, they are a disgrace to the human race. How does anybody who draws a paycheck to record history dare to ignore the biggest revolution in the last 60 yrs? The reason they are a disgrace is this is Freedom Loving Americans fighting against the tyranny their corrupt Establishment is trying to enslave us with. Every member of PravdABDNC should look in the mirror and ask themselves if this is what they worked their entire careers to do? Do they continue to allow FOX to record history and do they continue to be the Bernie Madoffs’ of journalism. Or do they do they do their jobs and become curious about the corruption which surrounds them? Either way, the anti-establishmedia is exposing it. We are the Revolutionary Army of the 2000s protesting the corrupt Establishment using cyber-printing presses. The Left considers themselves anti-establishment since they always were fighting against evil capitalists. They have been doing it so long and have become ingrained in so many areas of society they are now what they have fought against. So much so they have corrupted themselves to hide the very fact this is who they are. 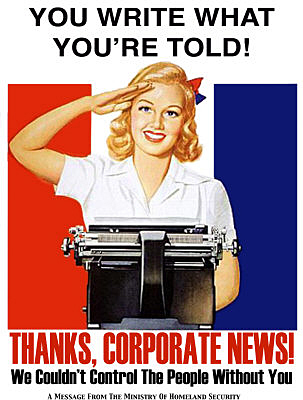 They control the schools, gummit, administration, bureaucracy, media and news outlets. We are the outsiders who simply work and pay taxes and who are pointing out their corruption and incompetence in our barely organized yet passionately attended Tea Parties. We are the Minutemen of Truth and Freedom. Not only has the Rallies and especially the Tea Party Express, exposed the absolute corruption of the news industry it shows the crassness of the Stalinist left. Reporters who are supposed to document histoir are attempting to unwrite the most amazing spontaneous combustion they have witnessed, perhaps ever. The same people who were using our brave soldiers’ coffins as Soap Boxes and Stage Props while bringing every plastic Starlet from SoddomWood extolling their passivity, now protests are unseemly, and verboten. Really, how hard is it to be a pacifist? Oh gee, you don’t like war, how heroic! Well get used to Conservative Activism cause this is 1776 and there is a wildfire burning across America bringing Freedom. The TP Express has 2 busses hop scotching America, driving patriots into the streets for peaceful demonstrations. How simple a protest could you ever imagine and the people are reacting. Not the Jesse Jackmail rent-a-mobs but real rebellion. It is growing as it gets closer to the East Coast while the passion of true Americans are touched. These are not masked street people but people who never protested in their lives willing to keep their Freedom over a lifetime of indentured slavery. These people represent millions of silent Americans who don’t take stands but are willing to support them w/their votes. This is something the Stalinists in the DNC and WH were not expecting and have no method of stopping. America isn’t Kent State yet so their army of Thugs at Acorn are not sure they want to enter this fray. The Tea Parties has wakened much of America. While walking in our parade on July 4th you noticed the people would look at us and our signs dumbfounded. Then as they read them about out of control spending, they would smile and then applaud. It takes a minute for those of us in the Silent Majority to understand its ok to protest the gummit. We are not the type to protest until we see something so outrageous that we will change our minds to realize its ok to protest. This is where America is right now as the people are beginning to take a stand against an out of control congress and President. This movement is beginning to sweep across this land like those Wildfires in the LA hills. This fire is burning bright as it destroys the lies of liberalism. As this fire grows, it won’t matter how many tankers of ACORN retard-ants, the fire will grow and burn brighter til the rocks melt into molten Bronze that form into Lady Liberty w/her Torch raising high, clutching the Law above this scorching inferno.